"Let her have her say" the president says of accuser Christine Blasey Ford. President Donald Trump said Thursday that it's time for the Senate to "get on with it" as the Judiciary Committee works to schedule a hearing to consider Christine Blasey Ford's allegation that Supreme Court nominee Brett Kavanaugh sexually assaulted her when they were in high school. "I don’t think you can delay it any longer," Trump said in an interview with Fox's Sean Hannity just before a campaign rally in Las Vegas. "They’ve delayed it a week, and they have to get on with it." Trump, who was in Nevada in large part to boost the re-election hopes of Sen. Dean Heller—the only incumbent Republican whose race is rated as a "tossup" by the Cook Political Report—told the crowd during his stump speech that Heller's vote "is more important than mine because he’s gotta help Brett get in." And, he added, "we're gonna get Brett." In negotiations with committee lawyers Thursday, Ford's attorneys said that she would be willing to testify as early as next Thursday—three days after the panel had hoped to hold a hearing—according to sources who spoke to NBC News. Additionally, Ford wants to testify after Kavanaugh, does not want Kavanaugh in the same room when she speaks to the committee and would like extra security precautions, the sources said. While the president has mainly campaigned in states that overwhelmingly favored him in the 2016 presidential elections — or in congressional districts where the same is true — Nevada went for Hillary Clinton in the last presidential contest. 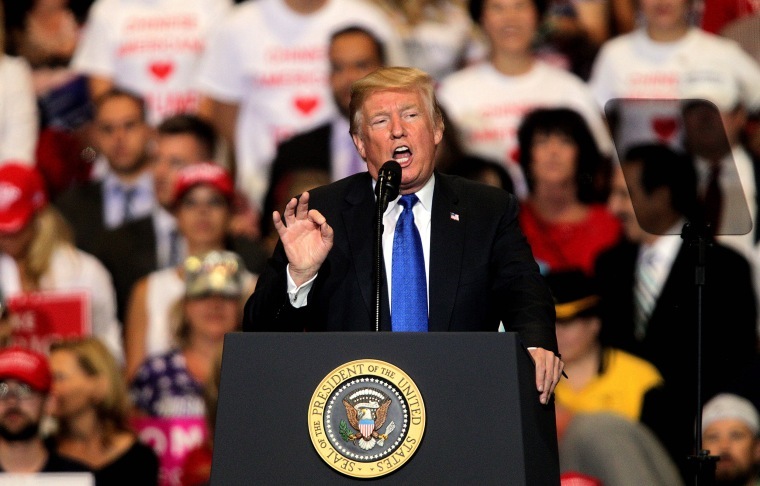 The reaction to his visit to Las Vegas will be a test of Trump's ability to rally Republican base voters around Heller, according to strategists in both parties. His stump speech appeared to be aimed directly at those voters who remain staunchly in his camp. One by one, he read off a list of his accomplishments in less than two years in office, he elicited chants of "lock her up" and "build that wall"—as well as booing for the Justice Department—and broke out the nickname "Wacky Jacky" for Heller's opponent, Democratic Rep. Jacky Rosen. He called the recent return of former President Barack Obama to the campaign trail "good news" because it would fire up Republican voters. And Trump also reiterated his pledge to consider American interests first just a few days before the opening of the annual United Nations General Assembly meeting in New York. "I'm the president of the United States," Trump said. "I'm not the president of the globe." Energizing his own base for Heller is a "very important" part of why Trump went to Nevada, said National Republican Senatorial Committee spokesman Michael McAdams. "You can’t win in Nevada without a very strong base turnout." Public polls suggest the race between Heller and Rosen is a dead heat, with the two candidates consistently within the margin of error. It has been roiled over the past couple of days by Heller's remark on a conference call Wednesday with the Nevada Republican Party that the controversy surrounding Kavanaugh's confirmation process is a "hiccup." Democrats, including Rosen, slammed him for playing down an allegation of sexual assault. On Thursday, Heller said he had been referring to "how poorly Democrats have handled this process." During the campaign, Heller has pointed to his support for an extension of the Violence Against Women Act—at a time when most other Republicans opposed the version on the Senate floor—as evidence that he's willing to buck his party in the interests of his state. And yet, with Trump, he's gone from agitator to ally—a shift highlighted by his turn in favor of repealing and replacing Obamacare. "It was not until the health care thing blew up in Heller’s face that he really started moving towards Trump," said David Damore, the chairman of the political science department at the University of Nevada, Las Vegas. Trump took note of the change in his relationship with Heller during his remarks Thursday night. "We started out, we weren’t friends," Trump said. "I didn’t like him, he didn’t like me. And as we fought and fought and fought, believe it or not, we started to respect each other, then we started to like each other, then we started to love each other." Jon Ralston, a longtime Nevada political analyst, said Heller's calculation is clear. "This guy was once an almost never-Trumper and he is now his biggest cheerleader," Ralston said. "So why would he be doing that in a purple state? Because Trump, as nobody else can, will inspire the Republican base to turnout." In the Fox interview, Trump also called for special counsel Robert Mueller's Russia probe to "come to an end" and said Republicans in Congress are just waiting until after November's midterm elections to give him the authority and funding he needs to build a border wall with Mexico. "I’m told by Republican leadership," he told Hannity, "that they will do it immediately after the election."